Bridging the Two Solitudes through everything —————————————————– There's little else like it on the web! In the last post I mentioned that Radio-Canada Première (radio) has three interesting current-events magazine programs which I regularly listen to, and which you may be interested in listening to. Also in the last post, I introduced you to the first of the three programs. In this post I will offer you another suggestion. 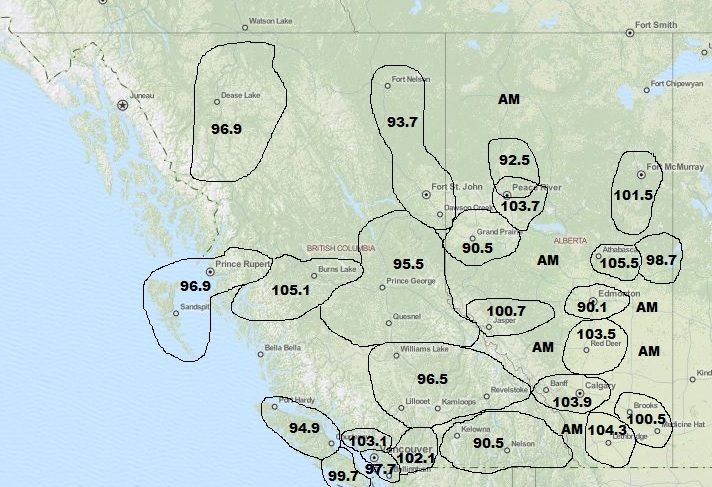 But first, I will give offer you a couple of maps in Western Canada showing where on the FM DIAL you can access these programs (In the next post, I will give offer you maps for Eastern Canada). Note, if you reside in an area which is not convered by Radio-Canada Première on the FM DIAL, you can do a quick search of your AM frequencies, and you will likely find an AM format (I don’t have a list of the AM stations which compensate for areas not covered by FM). Désaultels le dimanche is a current affairs radio magazine program which touches on all aspects of what is happening in our world. Although it regularly touches on subjects occurring in Québec, they are often transferable and equally applicable to matters which could be occurring across Canada (such as talking about the need for infrastructure / sewer investments, etc.). With that said, the program talks much more about subjects of a national nature than a local nature, and it often ventures into the sphere of international interest. Topics can be as varied as the environment, politics, social issues, new events, demographics or other societal challenges. I personally believe this is one of the most objective programs on Canadian radio (either in both English and French). Considering the complicated nature of matters discussed on the program, the host Michel Désautels does an amazing job of walking the thin line between a discussion program versus an opinion program (it is worth the trouble to listen to how he manages such a delicate role). There are THREE ways to listen to Désautels le dimanche. You can listen to it live on Radio-Canada Première every Sunday from 10am to 12pm noon.. You can also listen to re-broadcasts every Sunday at 8:00pm. The above link also offers you the opportunity to listen to archived programs, and chose which parts of those programs you wish to listen to. This podcast page gives you the added advantage of being able to listen to past archived episodes, along with a description of the topics of each past episode. Tomorrow is Sunday… have a listen and see what you think. By Quebec Culture Blog 101 in Uncategorized on September 5, 2015 .